Vancouver Paintless Dent Repair & Removal is a leader in removing small dents or dings from your vehicle. Our specialty is Paintless Dent Removal (also referred to as P.D.R.). We will also remove scratches at the location of the dent we remove for your convenience. Small dents from shopping carts, other car doors accidentally hitting your cherished vehicle may be removed by our technician at a fraction of the price of regular body shops. Serving the Vancouver area and with years of training and experience we can fix dents that, when done, will not be noticeable and bringing your vehicle back to its new condition in no time without the use of fillers or paint. Using specially designed tools we will gently massage dents and remove them from your cherished vehicle. Should you have minor scratches we will also take care of them as we repair the dent. from a customer's precious Cadillac Avalanche Pickup. 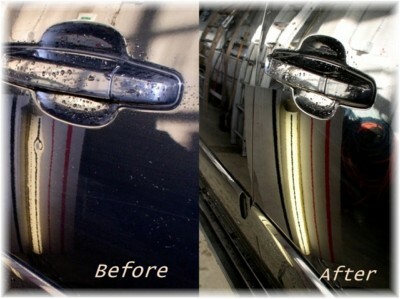 At Vancouver Paintless Dent Removal, we love to exceed your expectations. Superb craftsmanship and great value! For your convenience, we offer mobile service in Vancouver, Vancouver West, East, West, North and South Vancouver. We also serve Richmond, Burnaby, Coquitlam. Have the convenience of doing your day to day routine at your home for a small convenience fee. and let Vancouver Paintless Dent Repair & Removal take care of those annoying dents! Return from About Us at Vancouver Paintless Dent Repair to our Home Page here!